In each dish and each meal that I strive for beauty, simplicity and wholesomeness. I like to continue the activities in the kitchen in harmony with the seemingly effortless life processes in nature. Like images in a poem, I let each ingredient express itself through the different dishes. The cutting and cooking styles lift and lighten each food or give them weight and strength. Nothing is overpowering or complicated. To mix a lot of ingredients in one dish requires skill. Most often I am left with the same feeling as when I mix too many colors in my painting. The result is either chaotic or a dull, unsatisfying brownish gray. In a balanced meal the ingredients and cutting and cooking styles, as well as the individual dishes, enhance each other in order to create interesting dynamics. As in an engaging painting, an appealing meal consists of both gentle pastel-like dishes as well as colorful dishes bursting with movement and vigor. The main meal of the day can be a nourishing soup or stew with sourdough bread and sauerkraut. For the most part I create several qualitatively different side dishes around a whole grain dish. I always make sure to include a nourishing soup, whole grains, vegetables (especially leafy greens), protein-rich dishes, high-quality oils or fats, as well as fermented foods. The amount I serve of grains, vegetables, animal foods, oils and fats, desserts, and so on, varies with everyone's needs and the activities of the day, as well as the season. Everything is always changing. Life is dynamic. In all the recipes I use unrefined, whole, biodynamically grown or otherwise organically grown, and naturally produced foods and beverages. I choose seasonal locally harvested foods whenever possible. Locally grown biodynamic or organic whole grains, beans, vegetable, herbs, and seasonings are available in many health food stores. Some places have a grain mill accessible to grind your own fresh flours. It is more difficult to acquire local high-quality fermented foods, fish, raw dairy, eggs, poultry, and other meats from animals who have ranged freely and were fed grass. Much fish today is farm-raised conventionally on pellets. Real raw honey is a rare treasure because most beekeepers add penicillin to the hive, feed the bees sugar, and extract the honey by heat. Most organic eggs, chicken, meat, and dairy come from animals fed on corn in order for them to grow quickly and produce year-round. I go the extra mile to get high-quality foods and support farmers and distributors who sell the high quality. Soups are a wonderful and satisfying entrance for the meal and set the mood of the dinner. I create light, refreshing, and cooling soups, using cooking styles that lift and loosen with round or upward-growing vegetables, for spring and summer or when the rest of the meal is substantial. I make heartier and warming soups, using stronger cooking styles, emphasizing round and root vegetables during fall and winter days or if the rest of the meal needs grounding. Some soups are creamy and have a smoothness of color while others soups use ingredients that are crunchy, finely diced, and very colorful. Several soups honor just one or two decoratively cut vegetables in an almost transparent broth. Some soups are like stews where a variety of different ingredients, cut in chunks, almost form a meal by itself. I use a light broth or plain, crystal clear water as the liquid for the lighter soups. I make a vegetable stock for heartier and stronger-flavored soups and stews. I cook a stock of meat or fish bones for strengthening and warming soups. Stocks will last in the refrigerator for a week and for months in the freezer. The strength of the soup stock depends on how many ingredients there are and how long the stock has cooked. If a lot of water has evaporated and the stock is very concentrated, I dilute it before cooking with it. To make a delicious strengthening stock, cover bones of beef, chicken, or fish (including the heads and tails) with plenty of cold water. Add a couple tablespoons of vinegar and on occasion a tablespoon of green tea placed in a cheesecloth bag. Bring it slowly to a boil. Cover the pot and let the stock simmer for 4 to 12 hours. Let it rest overnight, bring it to a boil the next morning, and continue cooking as long as desired but at least 10 minutes. Strain the liquid from the bones. Vegetables such as carrots, onions, leeks, celery, and herbs such as rosemary, oregano, thyme, and bay leaf can be added to the stock and simmered along for the last hour. Solidified fats can be removed after the stock has cooled down. Cooking a variety of vegetable trimmings with whole vegetables makes a lighter, very nourishing and flavorful vegetable stock. Use especially leeks, carrots, celery root, cabbage stems (use only a small amount from the kale family), onions, winter squashes, and celery. Place the vegetables and trimmings in plenty of cold water with a 3 to 5-inch piece of kombu sea vegetable. The sea vegetables are the bones of the sea and a natural flavor enhancer. Simmer the stock for one hour and strain it before using it. A nourishing but neutral, very light stock is made by placing a 3 to 5-inch piece of kombu sea vegetable in a quart of cold water for 10 to 20 minutes. Remove the kombu and use it in other dishes - for example, when cooking beans. The sun-ripened golden grains are the heart of my meals. When prepared well, grains have a delicious, sweet flavor. I carefully pick out any debris before I cook them. Then I wash the whole grains gently by covering them with water. I run my clean hands through the grains a few times before I strain the water off. I do this until the rinsing water is clear. Afterwards I add the cooking liquid, which most often is plain water. Stocks and spices are fun additions to the cooking liquid only once in a while. For digestibility, I soak the grains in slightly warmed water with an added dash of liquid from natural fermented foods. I use sourdough for bread making. Most often I make whole wheat bread, but I also make sourdough breads with combinations of rice, oats, millet, rye, barley, and corn flour. When using grains other than wheat, I use less flour. The dough is moist and can be spooned into the baking pans. Well-done sourdough bread is sweet and only slightly sour. Yeasted and chemically leavened (baking powder and baking soda) breads are lighter and quicker to make occasionally but no comparison in quality. When cooking a main meal, I make several side dishes of freshly cooked, locally grown seasonal vegetables. I use a wide selection of roots, leafy greens, fruits, and seeds in appropriate proportions, using a variety of cutting and cooking styles. I serve at least one side dish that include beans (lentils, chickpeas, etc. ), bean products (tofu and tempeh), fresh or frozen fish (preferably wild or farm-raised organically), free-range poultry, eggs, grass-pastured meat (including organ meat), or raw, unhomogenized, cultured dairy products like yogurt and raw cheese. I rarely cook with dairy products, except for butter, since the pasteurization completely changes the quality and makes them difficult to digest. Animal foods are much more condensed and bring very different qualities to the meal than vegetable quality foods. Dairy can be imagined as a food somewhere between vegetable and animal foods. Fresh, unprocessed or cultured dairy, fish, or animal foods have been part of many different cultures' dietary heritage. To either exclude or include animal foods in the diet and to decide the appropriate proportions is a personal choice that must be seriously considered by each individual. When cooking beans, I add a small amount of kombu sea vegetables for flavor and digestibility as well as spices to bring about movement. Soybeans are best only eaten in the form of miso, tempeh, and occasionally tofu seasoned with soy sauce. Healthy oils and fats are very important ingredients in the meal. They are naturally present in grains, beans, fish, meats, seeds, and nuts. I use high-quality unrefined, cold-pressed extra virgin olive, freshly pressed dark sesame oil, freshly churned butter, cream, and other high-quality animal fats. I often sprinkle freshly ground flax seeds, soaked and roasted sesame or sunflower seeds, and various freshly shelled and soaked nuts on grains, salads, and desserts. Soaking the nuts and seeds make them more digestible. For most of the year I supplement one meal a day with a small amount of cod liver oil and fish oil as well. Herbs and spices originate from all parts of a plant: the roots, bark, leaves, blossoms, fruits, and seeds. Their abundant fragrances and flavors, tastes and aromas fill our senses and alter the quality of the dishes. In my garden I grow rosemary, thyme, oregano, dill, parsley, scallions, chives, sage, coriander, marjoram, chamomile, chervil, basil, caraway, mint, tarragon, and garlic. All winter I pick many of these herbs fresh from plants growing in pots on my enclosed sun-bathed porch. Other natural seasonings that I use regularly are naturally fermented apple cider, rice or balsamic vinegars, fresh cold-pressed extra virgin olive oil, fresh dark-roasted sesame oil, cultured butter, zesty mustards, sun-dried unrefined sea salt, and traditionally fermented and aged tamari and tamari soy sauce (shoyo), miso, umeboshi plums, and umeboshi vinegars. I add small amounts of sea vegetables, like kombu, as a bean tenderizer and natural flavor enhancer of the whole foods. The ways in which I prepare vegetables and grains bring out their natural sweetness. The whole meal is therefore naturally sweet. The other major flavors, salty, pungent, sour, and bitter, are represented without dominating delicate flavors naturally found in whole foods. 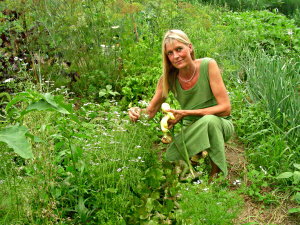 I serve some kind of fermented or raw food with each meal. Naturally fermented and cultured foods are an exceptional way to prepare different ingredients and some of the most important side dishes or condiments in our diet. They are often overlooked or not mentioned when we describe what we had for dinner, and yet they are pivotal in creating a well-balanced nutritious meal. They add a bounty of nourishing and life-promoting substances and forces, almost miraculous curative properties, and a wealth of color, flavors, and shapes. They increase the appetite, stimulate the digestion, and make any simple meal festive and satisfying. It is relatively simple to ferment or pickle vegetable foods. Most can be ready in a few hours or in a few days while others, like miso, can take years to mature. The different pickles and fermented foods have different properties, effects, flavors, and consistency. Some are more sour, some salty, some crispy, and some soft; some are strengthening and warming, others loosening and cooling. If, for example, a heavier meal is served with fried foods and well-cooked dishes, a lighter, cooling fermented food is preferred to balance the meal. Most of the time I create a balanced meal that is complete and satisfying without a dessert. 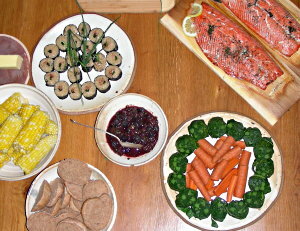 A balanced meal in itself is naturally sweet, colorful, and flavorful and includes a variety of textures, cooking styles, and cutting techniques. Adding fermented foods and various condiments to the meal brings all the dishes to a unified whole. Once in a while I make a dessert or sweet beverage using natural processed sweeteners. Sweeteners are very concentrated (forty quarts of maple sap make one quart of syrup) so I use them in small amounts. My favorite sweeteners are maple syrup, sorghum, barley malt, rice syrup, raw or cooked fruit, and fruit juices or concentrate. I use raw, unpasteurized honey in dressings and dishes that do not need to be heated. Serving the meal is the presentation of our artwork. Arrange the individual plates beautifully with all the dishes together side-by-side, or use decorative simple serving bowls. Give the foods a chance to show their individual beauty, colors, and forms by displaying them on a plain background, leaving plenty of space around for them to "breathe." How beautifully a natural glazed ceramic plate complements a simple dish of steamed bright green broccoli with a creamy light dressing! When we serve the meal, we can think of it as a whole and at the same time allow each dish to proclaim its own glory. Imagine a harmonious conversation taking place between each dish. Let them complement each other in color, shape, and taste to create a balanced whole. Once in a while serve the meal in courses or a few dishes at a time, so that they really can be seen and enjoyed on their own. Garnishes bring liveliness and movement to the meal. Besides a sprig of fresh herbs, I garnish with finely cut watercress and other green vegetables, radishes, celery leaves, carrots, and raw onions. I cut decorative shapes out of fruits and vegetables (carrot flowers, radish chrysanthemum, or apple slices), or use a little grated daikon, fried bread cubes, roasted seeds and nuts, ginger, wedges of lemon, orange peel, horseradish, and colorful edible flowers (dandelion, nasturtium, borage, violets) for garnishes. Used appropriately, garnishes add beauty and balance to the meal. Create a simple, peaceful, and lovely atmosphere around the dinner table. Remove any clutter and clean the eating space, even if dining alone. Set and decorate an attractive table using a tablecloth or place mats, cloth napkins, nice serving dishes, glasses and plates. Place just a few fresh flowers, pretty rocks, dried or fresh leaves, a potted plant, or candles on the table to set a seasonal mood. Do it subtly. This is the frame around our artwork, the meal we have prepared.